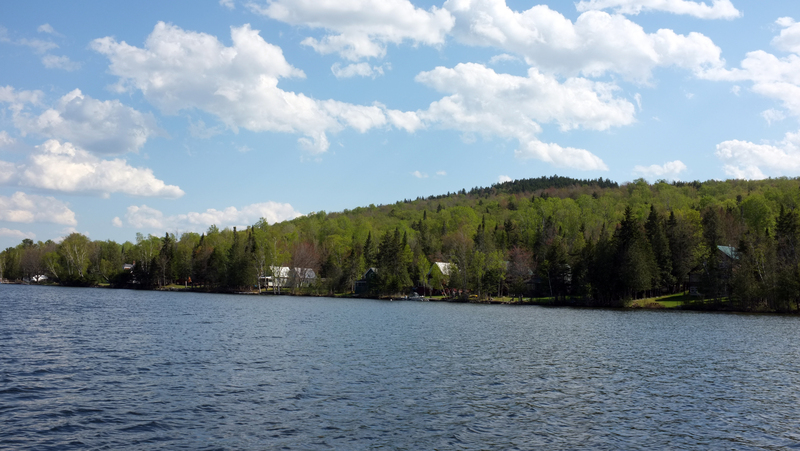 Over Memorial Day weekend, my husband and I visited friends in the small town of Rangeley, Maine. Before we made the drive to Rangeley, we started our tour of Maine in Portland. We picked up some friends at the airport and then grabbed drinks and snacks at The Thirsty Pig, where we were greeted by happy hour and an extensive sausage selection. Afterwards, we piled into the car to make the 2.5 hour drive to lakes region of Maine. We stayed with friends in the village of Oquossoc, just a ten minute drive from the town of Rangeley. 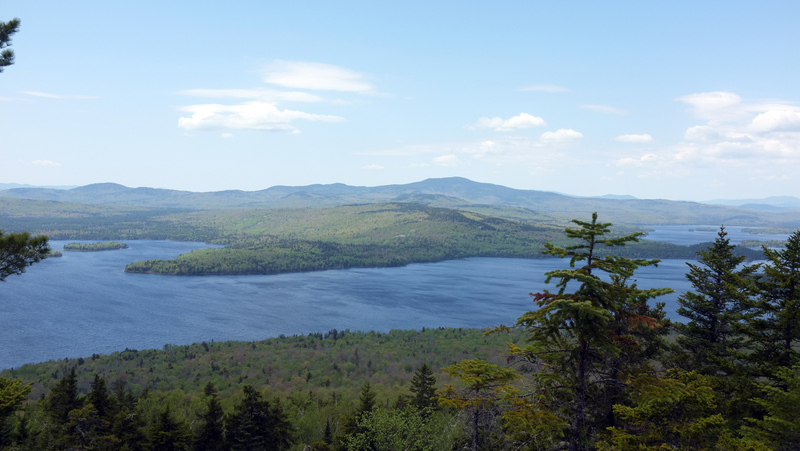 Both town and village are on beautiful Rangeley Lake and are a great base for exploring the region. While in Oquossoc, we visited a few bars in town, including the Four Seasons. 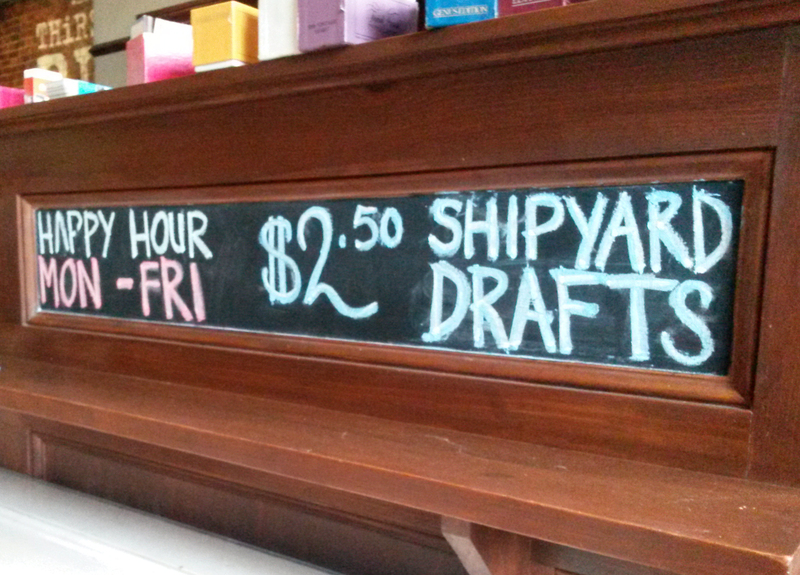 It was a casual, laid back place with friendly bartenders and great deals. 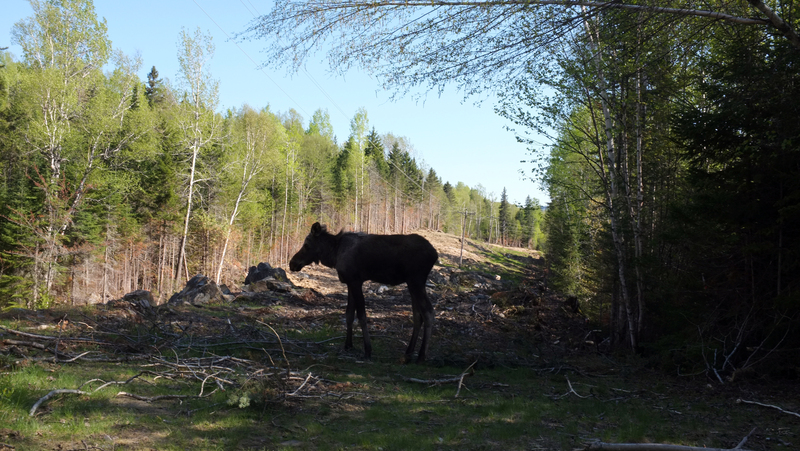 We had high hopes of checking out Moose Alley, the local bowling alley in Rangeley, but we never made it. We’ll have to go there next time as we heard good things about the friendly staff and great food. While in Rangeley, we were introduced to the owners of the Farmhouse Inn. They have hostel-like accommodations for hikers trekking the Appalachian Trail as well as private rooms with kitchen facilities. The entire property is so lovingly built and maintained by the owners. They are remodeling the existing structure and building new structures with reclaimed materials when possible. For photos and more information, please check out their Facebook page. Though we did not stay there, I cannot express how impressed I was with the projects they are working on and their warm hospitality during our visit. We also enjoyed the outdoors as much as we could and took in all of the natural beauty Maine has to offer. We hiked up Bald Mountain (worth the climb). We also hiked Cascade Falls (also locally called The Cascades) and crossed paths with a young moose! Both locations are part of a local land trust and therefore are free of charge. We had to slowly walk by this young moose to continue on the trail while also keeping an eye out for the mother moose. We also took a boat tour on Rangeley Lake with Kevin Sinnett, Captain of the Oquossoc Lady (rangeleylakecruises.com). Lounging on the boat while taking in all the beauty was a wonderful way to spend an afternoon. Mr. Sinnett also offers a few private suites right on the lake. Check out the website or you can use Airbnb.com to book a suite. When we visit Rangeley again, I know we have lots of options of where to stay to enjoy this awe inspiring part of Maine. We stayed in Panama City for a few days and I think that was enough for us. While the city seemed nicer and safer than other Central American capitals we have been to, it’s not a budget friendly city. All the hotels/hostels seemed either cheap and really rough or okay but not worth the money for what you get. We stayed in the Las Vegas hotel and paid about $85 for a double room. And while it was adequate (air conditioning, wifi, fridge & microwave, good location), it seemed expensive compared to the rest of the country. We went to Casco Viejo which was nice looking but seemed like a false front when you have already seen the real city. I do, however, recommend taking a cab (about $5 per person) out to Panama Viejo to see the ruins. It’s free to wander the grounds and look at the beginnings of the city. We did not pay to get into the museum so it was a cheap outing. Also, we went out to the Panama Canal to see ships go through the locks. To save some money, I recommend only paying for the observation deck. Skip the museum and 3-D movie and watch the PBS special before you go. While in the city we ate some great food but it was harder to find a good, cheap meal. Prepare to spend about $10-$20 per person on lunch or dinner in Panama City. We ate at Beirut and Caffe Pomodoro after having had our fill of Panamanian cuisine. Also, on average the national beers (Atlas, Balboa, and Panama beers) were $2.50 in the capital. I recently spent a few days in New York. I wanted to wander the city but also see some of the major sites. I went to Ellis Island and Liberty Island. Now, I made the mistake of thinking that since summer had not started, that I would have no problem walking up, buying a ticket, and getting on the first ferry to the islands. Boy was I wrong. So, I recommend purchasing tickets ahead of time so you won’t have to wait in the same line as the rest of us poor schmos who waited in line for a full hour before getting on a ferry. Reserving tickets is no more expensive. You just have to know what day and time you will be there to use your tickets. I also went to see a play on Broadway. Instead of paying full price, visit http://www.tdf.org for discounted theater tickets. One of the ticket booths is on the South Street Seaport. There is another ticket office in Time Square but I recommend avoiding that booth along with the area at all costs. It’s way too crowded. There will be a board with all of the shows that offer discounted tickets. There will also be people you can ask questions of and get descriptions on what the plays are about. Get there early, at least 30 minutes before the booth opens to try and ensure you get tickets to the show of your choice. See the website for more information. Last, but not least, I went to New York to eat. I highly recommend checking out the food trucks in the city. Food trucks are not the same as the street food vendors. Food trucks are usually trendier foods with better ingredients (think braised beef tacos with pickled onions). But, since they are competing with the food vendors and nearby restaurants, their prices are very affordable. This is a great way to eat something tasty and keep your costs down. It’s also a nice way to enjoy all of the public parks New York has to offer. Assuming the weather is good, you can sit outside and enjoy the view while eating delicious food. If you have a smartphone, look into downloading one of the many food truck apps that are available. Also, you can follow most of these food trucks on Twitter. Hallstatt is a picturesque town in Austria, the one most people have seen online or on postcards. During the day, tourists come by bus and by boat to see this small town right on the lake. But by nightfall, the town becomes peaceful again. We wanted to really enjoy Hallstatt and the surrounding area so we stayed for a few nights. We rented a room at Haus Lenz which was 26€ per person for room with a private bathroom. It’s up the hillside a bit but the views are well worth the climb. We went to the Prehistoric Museum for 4€ which had very interesting information on the Hallstatt area over time. All off the information is in English and German as well as many other languages. We also visited the Beinhaus (Bonehouse) where the bones of past Hallstatt residents are displayed. Due to a lack of space in the cemetery and in the town overall, burials are only temporary. After 10-15 years graves are opened and the bones are cleaned and placed in the Beinhaus. This practice ended some 40 years ago and is a very interesting way to spend 1€. 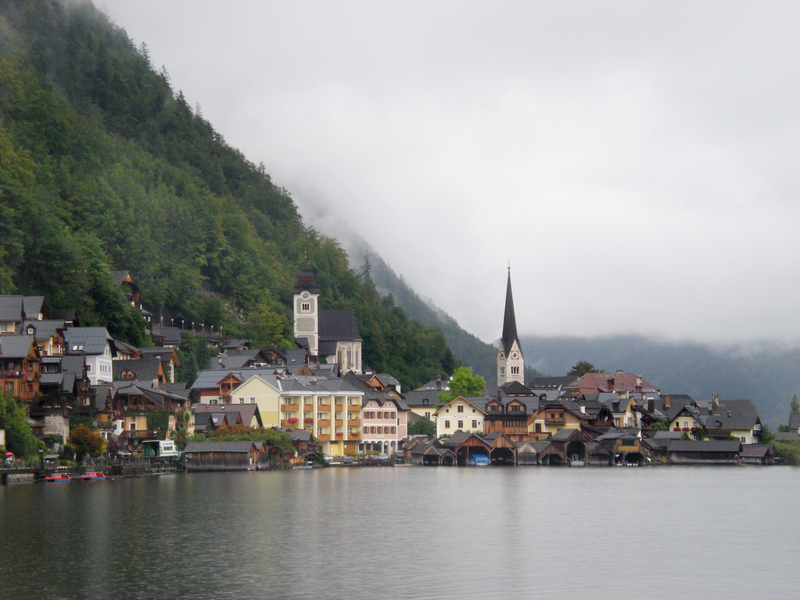 When we were in Hallstatt in September 2011, the town was just putting together a self-guided walking tour. It was not up and running yet but there were already numbered plaques all around town. For 5€, you get an MP3 player and a set of headphones. During one of our days there, we took a bus over to Obertraun to do some hiking. The tourism center in Obertraun was very helpful in providing maps of hiking trails. We hiked for about an hour to get to Koppenbrullerhohle which is a cave you can tour. The cost was 7.50€ and is only open May through September. While I did not think the tour was worth the money, I thoroughly enjoyed the hike which got us there. It was a great way to spend a day.